Looking for a reputable sheet metal fabrication company to manufacture a custom spiral round or flat oval duct system for your facility? With manufacturing facilities in Benson and Garner, NC, Hamlin Sheet Metal manufactures flat oval and spiral round duct systems above industry standards. We’re proud to be the spiral round and flat oval duct manufacturing specialist trusted by industrial and commercial clients across the Southeast and beyond. Hamlin Sheet Metal utilizes over 100,000 square feet of manufacturing space, along with state-of-the-art fabricating and project management technology. Spiral round and flat oval ducts are manufactured in strict accordance with SMACNA standards and in adherence with ASHRAE and SPIDA guidelines. Our flat oval and spiral round duct fabrication specialists and engineers are ready to assist in value engineering any project to deliver cost-effective, specified performance. 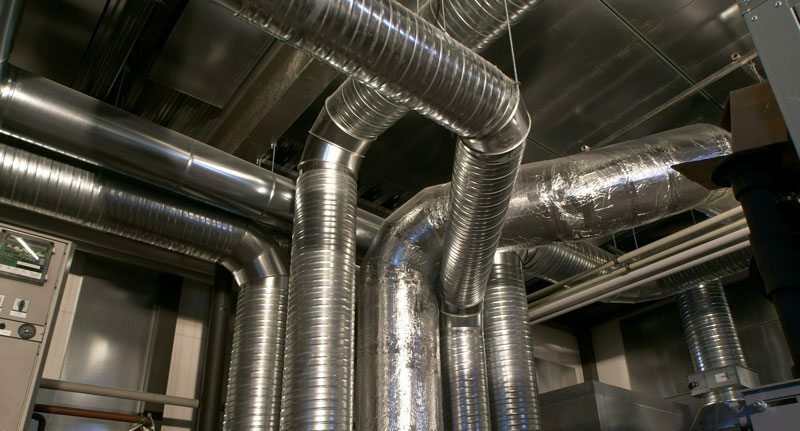 Our commercial duct systems include single and double-wall spiral round and flat oval ducts, welded industrial ducts, specialty products, and more. We fabricate a wide range of metals, including galvanized, galvannealed, stainless steel, aluminum, PVS, galvalume, black iron, and antimicrobial, all in multiple grade and gages. Our welding capabilities include both TIG and MIG weld fitting and longitudinal seam ducts. For detailed product specifications and submittals, please see our Resources page.